Yay Bingo is an online bingo site that is fairly new to the market, and as a result has a steep uphill climb if it is to make a name for itself in one of the busiest industries in the world, and one of the toughest to crack. Yay Bingo isn’t coming in with nothing though, created by the minds behind Queen Bee Bingo above others, there’s proof already that the developers of Yay Bingo have the ability to release an exciting and effective online bingo site, but as we’ve seen many times before, doing it once does not guarantee an ability to continue doing it. However, it does feel like Yay Bingo isn’t messing about. Arrive at the site and you will immediately be informed about the lack of wagering requirements attached to the bonuses here, something that will be music to the ears of many online bingo players who are tired of small print making promotions less tempting than originally thought. So, a strong start from Yay Bingo, and a way to ensure that they will get noticed, but once they have the attention of players, are they then able to keep it? The design here is nothing spectacular, in fact it’s about as basic as you’ll find at a bingo site, but assuming that as a bad thing is not necessarily correct. Bingo has always been steeped in traditions, from bingo calls in bingo halls, to more modern habits like the colour schemes and designs of online bingo sites, and Yay Bingo could be perceived to be a celebration of this. Yes, the site is riddled with clichés such as pastel shades of blue and pink that interchange to create the backgrounds to various parts of the Yay Bingo site, but these colours are comforting to players who appreciate the familiar with their bingo play. Navigation is as simple as it needs to be here, with all information on promotions and on the site itself easy to find, and thumbnails allowing instant access to not only bingo games, but also to the host of other titles available at the Yay Bingo site. Sometimes, simplicity is the best way to go, especially in the online bingo world, and Yay Bingo is a prime example of this. The design here may be similar to other online bingo sites, but the collection of games certainly isn’t. The number of bingo rooms here stands out enough, there are VIP rooms, a different room (and jackpot) for every day of the week, and various buy in and jackpot prize amounts on other games. 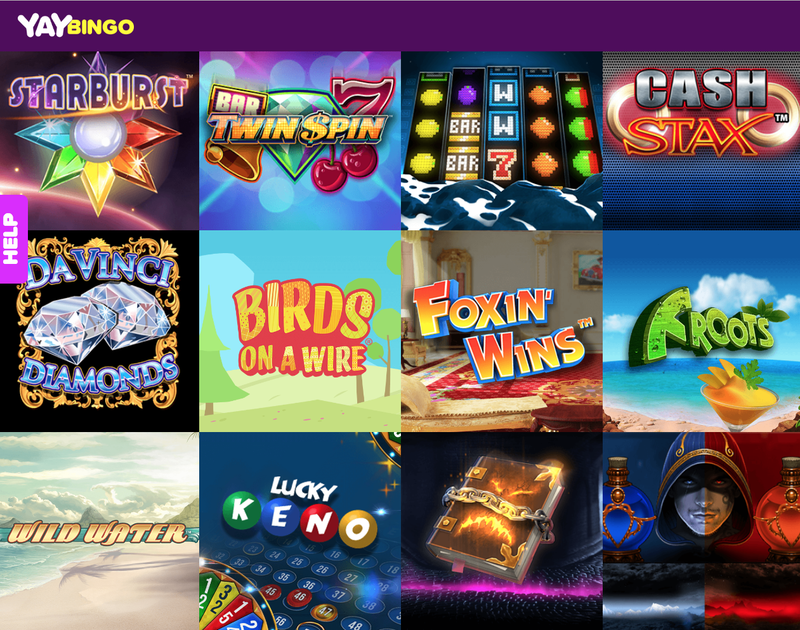 However, it is arguably away from their bingo titles that Yay Bingo really stands out, offering a selection of table games and slots that many online casinos cannot compete with. Titles coming from the likes of 888 Holdings, Bally Wulff, Eyecon, IGT, IWG, NetEnt, NextGen Gaming, PariPlay, SG Gaming, Thunderkick, and Williams Interactive ensure an abundance of choice for players of any kind. Yay Bingo actually functions as an effective online casino as well as an excellent bingo site, so if you are the kind of person who likes variety with your iGaming experience, then you may well struggle to find a site that allows you the amount of options you will find at Yay Bingo. A fantastic new site that, while not looking like anything different, combines its no wagering requirement set-up with an excellent games selection to create one of the best sites we’ve seen in a while.